The Golem is one of the premier Caldari Battleships available to experienced and skilled Caldari pilots. 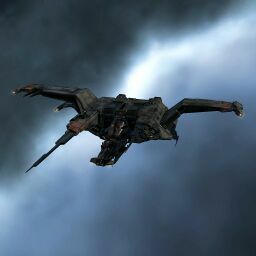 It is a heavily modified Raven Hull that makes use of a Bastion Module in order to greatly increase its combat performance. It makes great use of Torpedoes or Cruise missiles in conjunction with the bonus to Target Painters, either weapon system is viable however the schools of thought are very competitive. However they can both agree that this Marauder is an active shield tanked battleship and is very effective in level 4 mission running. Until recently, the Golem was a red-headed step child of the other Marauders, capsuleers often favoring the Vargur or the pirate battleship Machariel. Luckily with Rubicon and the changes to Target Painter cycle times, as well as the Marauders' new bonus to micro jump drives, the Golem has become a more popular choice than in the past. Cruise Missiles, and Torpedos should be trained to V, and Cruise Missile Specialization/Torpedo Specialization to at least I to fit T2 Launchers, which do more damage, along with providing the ability to use T2 ammo types. Along with the requisite Engineering and Electronic Systems skills required for adequately fitting most ships. Weapon upgrades and Advanced Weapon Upgrades should be trained to V (as this is a requirement anyways) to help alleviate fitting problems. Shield Operation and Shield Management should be trained to at least IV to improve shield capacity and recharge rate. While Tactical Shield Manipulation should be trained to V remove shield penetration chance and to allow the use of the T2 Shield Boost Amplifier module. The Micro Jump Drive will be primarily used for getting gate to gate; zooming out and measuring a distance with finger and thumb from your ship to 100km out can help you gauge where you need to jump in order to put gates that are outside of 15km in range a second. Inside of 15km, you're better off approaching. Bastion+MWD trick allows marauders to warp almost instantly after coming out of bastion. Hoover the mouse on the decycling bastion module to see exactly how long it has left. At 9 second mark start cycling the MWD for one cycle and start spamming "warp to" hotkey. After the bastion mode ends you will get one second of MWD that accelerates you to near warp speed and the marauder will warp in 2-3 seconds. Additionally the bastion mode makes hostiles unable to activate warp disruption or scram so you will not be pointed when the bastion ends giving you a small window to escape before the points are activated. Marauders in bastion mode can jump Wormholes as normal and be instantly out of bastion mode on the other side. You can write additional notes for Golem here. This page was last modified on 25 March 2019, at 17:15.